When Ken Taya opened the floodgates of cuteness, this book came out. But don't let the cuteness deceive you, there's more than that in the book. Ken Taya is a talented and hardworking artist who has worked on several big name game titles, commissioned jobs and on his free time draws cute stuff. 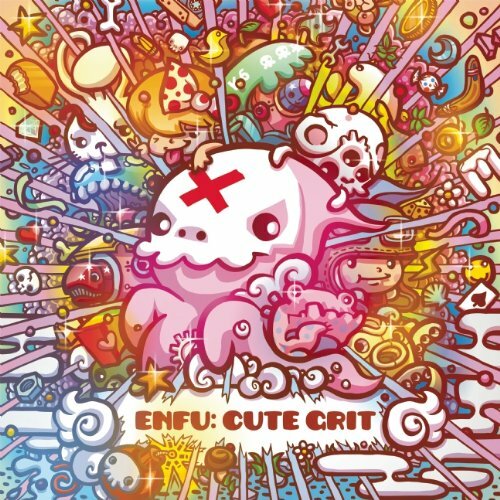 Enfu: Cute Grit features his personal works as well as the commissioned projects but leaves out those created for games. Game art would feel out of place in the book. This book is huge. 248 pages. Hardcover. As if the cover is not striking enough, the page edges are treated with bright pink colours. Flipping over the cover, a bunch of cute glittering Chinese gods await to greet you. The juxtaposition of style and subject matter is quite amusing, and that applies to most of his illustrations. The first section of the book is filled with daily items turned cute, drawings with cartoon-like simplicity dosed with welcoming subdued colours. They are laid out in a 5 by 5 grid and there are over 60 pages of them. The last few pages features pop culture characters, such as Naruto, Batman, Totoro and more. The next few pages show his enterprising nature with designs for clothing and furniture. Then there are the splash pages, comic strips and characters he has created, and many other funny ideas. If you're one who's into pop culture, you might be able to spot inside jokes in his illustrations. The latter half of the book has more serious work. There are sketches of life figures, cars, digital paintings, graphic creations, thoughts and doodles, and even step-by-step screenshots of how he creates his illustrations. So it's not just cute, but you get to see the more technical side. The artworks are beautiful and Ken Taya's work rate is really inspiring. The book has over hundreds of illustrations from his wild imagination as well as those inspired by pop culture. There are some text in the form of acknowledgement from other artists, and Ken Taya also talks briefly about his work, inspiration and what is Enfu. Inspiring and often encouraging quotes known as Enfuism are placed randomly throughout the book.